If the expose effect is prevented, can the Runner still trash GPI Net Tap to jack out? Yes. Each effect is separate from the other. "Then" does not imply any conditionality to the expose effect, it only indicates the order of resolution. We'll be coming back to this one when card rotation first hits in Spring 2017. This looks to be the first of likely many cards we will be getting that are tweaked versions of Genesis cycle cards incorporating lessons learned from years designing the game and watching the meta evolve. It will be interesting to see what Damon and his team indirectly tell us about how they perceive card and faction power levels through these. Here, it seems like they felt that Snitch had an effect which deserves a spot in the Criminal color pie, but they likely felt that once it had hit the board in a deck designed for it was a bit too permanent and/or non-interactive. With Au Revoir and enough link to run Cloud breakers, a Criminal jack-out deck had essentially complete impunity to bounce off outermost ICE every turn no matter what subroutines that ICE may have, building free cash, free information from Reflection, and a free battery of multi-access from The Turning Wheel counters and essentially being untouchable for many Corporate archetypes until they made their unstoppable mega-run. Strategies like this one alongside powerful icebreaker tutors and overwhelming AI breakers are part of what have been contributing to a general meta environment of devaluing the ICE that corporations slot, and this drives Glacier decks away from the meta unless they can slot very specific answers to such decks (Executive Boot Camp is one such card that springs to mind). I for one am glad to see this card, because it means that Criminals still get to keep an important part of their factional abilities without continuing that undesirable trend. Criminals may not be able to tutor up instantaneous answers to ICE, they may not be able to install one single AI Icebreaker and guarantee access to their target, but if they're willing to spend 3 and a deck slot they will still be able to pressure the corporation in the early-game without a full breaker suite and not jeopardize their lives and valuable programs. 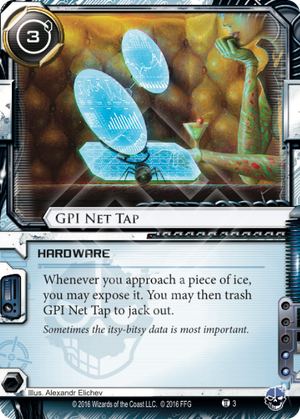 I don't know if GPI Net Tap will be a card that sees much competitive play after Snitch has left us, in fact I suspect that it won't, but I also feel that is fine. It is a balanced card that offers a useful ability, and it's a card that Criminals deserve (even if it's maybe not the one that they want). GPI Net Tap seems, like most runner cards of this cycle, to have a strong synergy with other Flashpoint, Core and faction big box cards. With Khan, Golden and other released cards up of Blood Money, it seems to promote a credit denial strategy that allows for ICE control. Drop it and run in the early game, to pressure low value servers, forcing rezzes with no risk. Still struggle to parse the card art. I love it. There's been a lot of nasty ICE released recently. ICE with fear-inspiring subroutines and potent on-encounter effects. ICE that is costly to break, even if you have your breakers ready. And these aren't all Sentries. Code gates are going from deadly to deadlier. And now a spiky ball of death threatens our programs. What is a runner of humble means to do? I've never used this card before, but I think I'm going to start. Run with impunity early game, put pressure on those Corporate bastards, and slowly build up your rig. Sounds like a plan! This card has decent potential as a one-shot safety net. It's straightforward and maybe a bit expensive. It's a flexible but self-trashing Snitch. However, a certain card came out with synergy that makes it extremely powerful, and not many have realized it yet. GPI's text is an interesting one in that both of its abilities are optional. On approach, you may expose approached ice (note: rezzed cards can still be exposed). You may then trash this to jack out. Most important to this, you don't need to activate the second sentence. What this means for the turtle is that every single ice in a server, whether rezzed or not, charges a virus counter. You can get one per run bouncing off of something simple like an Ice Wall, or you can use other breakers and bypass effects to gain a counter for each ICE in a server (and then perhaps another from access). Even more ridiculous is that GPI isn't unique, so you can get 3 down and gain 3 counters per ice. The bounceback potential makes purging almost pointless, essentially negating Aumakua's weakness. With how strong this combo is I fully expect GPI to get errata for uniqueness if it ever sees mainstream play. Until then, happy hunting! EDIT: It's now clear to me that rezzed cards can't be exposed under the new rules, so it might only work for unrezzed Ice. We might need a dev ruling to clarify this, as GPI will still attempt to expose a card even if the ICE is rezzed, and it has potential to change the game state.